We recently realized we had access to a landfill of valuable on-page SEO data, so we started digging. We then released our study analyzing on-page SEO issues. On-Page SEO is the code and words within your website that affect how well your pages rank in search results. 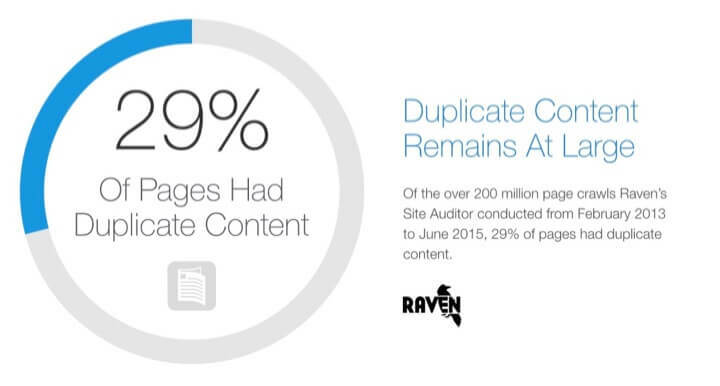 Between early 2013 and mid-2015, marketers deployed Raven’s Site Auditor tool to check and recheck 888,710 websites for on-page SEO issues. We anonymously analyzed this data and discovered the 5 most common on-page SEO issues affecting the average website. The infographic below is an ideal teaching aid when explaining on-page SEO to prospects and clients. Feel free to use it where you’d like. Below are the 5 most common on-page SEO issues, as well as how to fix each issue. If you’d like to try the Site Audit out for yourself, we offer a 14-day free trial. Give it a test run. Kick the tires a bit. Which on-page SEO issues should I fix first? Image optimization issues are prevalent, but I wouldn’t work on images first unless images are an important part of your website. For instance, image optimization would be really important to a stock image website or a food blog, but perhaps less important for other websites. Out of all image issues, focus on broken images and missing alt attributes before other image issues. The alt attribute helps search engines decipher the subject of an image and therefore when to include images in search results. Google image search receives over 1 billion page views every day. If your images are optimized, you’re more likely to get regular traffic from Google image search and traffic from image-based social networks such as Pinterest. 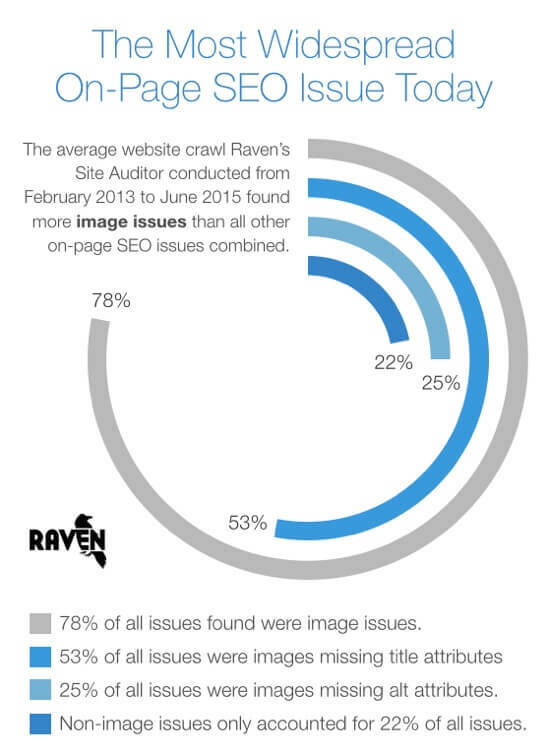 Run an SEO audit to see which image issues are affecting your website. If you’re using Raven, after you crawl your website, go to SEO > Site Auditor > Images to view all image errors. Replace all broken images with new ones or delete them. Add alt and title attributes to any important images that don’t already have them. If you’re using WordPress, edit a blog post, click an image, and click the edit icon to change an image’s settings. Here’s the difference between an image’s alt attribute and title attribute and when to use each. Duplicate content is any content on your website that is the same or very similar to other content across your website or across multiple websites. Here are some examples of duplicate content. If duplicate content is not malicious, Google usually does a good job of ranking the most authoritative version of a page. Though, there are cases when optimizing or cleaning up duplicate content can make a difference in how high your website appears in search results. First, run an SEO audit to see how much duplicate content is within your own website. This will allow you to start to assess the situation. Make sure any duplicate content within your control is being redirected to the most authoritative page. You can also use the canonical link element to communicate to Google which duplicate content should rank higher. Figuring out the best thing to do about duplicate content, if anything, is a case-by-case thing. Here are 10 duplicate content scenarios and how to solve them. This which should help when thinking through your own website and strategy. Over a third of all pages analyzed in our study had no meta descriptions. Meta descriptions are short descriptions of your page’s content. You see these snippets in search results under each page title. Having an engaging meta description can entice people to visit a page or reassure them they are about to view the content they are looking for. If you use WordPress, the easiest way to edit meta description is to use something like the Yoast SEO Plugin. Use an SEO audit software and crawl your website for issues. 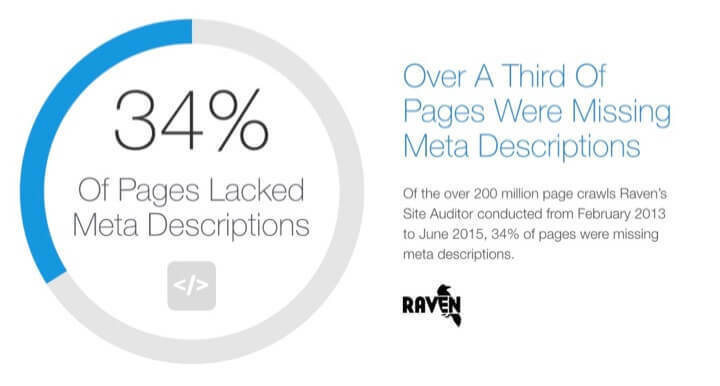 If you’re using Raven, after you crawl your website, go to SEO > Site Auditor > Meta to view all your meta description errors. In WordPress, add meta description to each page that’s missing one. Here’s a guide on how to write meta descriptions for maximum clicks. Here is a breakdown of all the meta description issues we found if you’re interested. Schema.org microdata allows search engines to make sense of your content so they know how to display data during search experiences. For instance, search engines might use microdata to do things like include user ratings next to a product or display your recipe in search results based on ingredients within your dish. 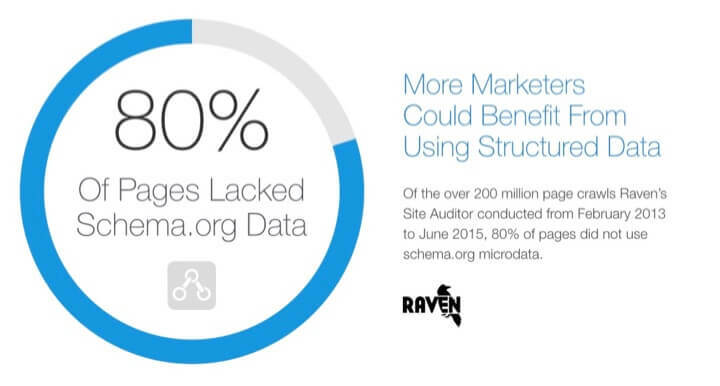 Only 20% of pages used schema.org microdata, meaning 80% of pages did not. This isn’t necessarily an issue, but it could represent a missed opportunity. Here are more details. The easiest way to create HTML with schema.org microdata is to use the free Schema Creator tool and then include your custom code in the proper places within your pages. When high-quality websites link to your pages, it’s a sign to Google that your website is also of high quality. Links from one of your pages to another can also work in the same way. Additionally, broken links create a poor user experience and, therefore, can be a signal to search engines of low quality. Use an SEO audit software and crawl your website for link issues. 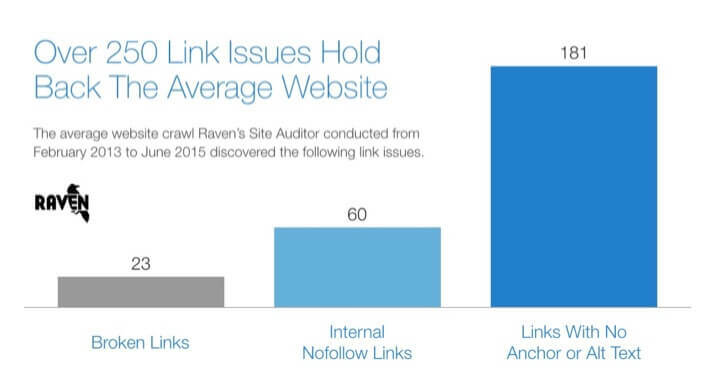 If you’re using Raven, after you crawl your website, go to SEO > Site Auditor > Links to view all your link errors. Start by fixing your broken links. Either remove them or update them with updated resources. Keep in mind that this list ranks on-page SEO issues by prevalence and not by importance. The goals of your website will play into your priorities. Additionally, some on-page SEO issues can be uncommon, but extremely important. For instance, your robots.txt file could be asking search engines to not rank your pages in search results at all, but this isn’t a common issue. If you’re looking for what to review on your website first, here are the top 6 priorities after running an SEO audit. The best way to see which on-page SEO issues could be holding back your website is to use an SEO auditor that can give you a list of exactly what needs to be fixed. Your website or your client’s website will have unique strengths and challenges. Good luck! I’m interested in your tools. Does it work for Persian sites? Do you accept users from Iran? Yes! You can do research and reporting for any website online. We have users from all over the world. There are some options like changing your default AdWords country in Campaign > Settings, and all text will render properly, but all description text is in English. Is there anyway I can send a request and link up with you? These are really very important and frequent issues, thanks for the guide. Wow, this is really interesting. I would never had imagined that pictures can cause so many issues. And yet, in order to have a nice, optimized page, you have to include them. Speaking of which, really nice article Nathan! Great digital solutions! Thanks so much for reading and the nice words! Images are pretty interesting in that one hosted image that is displayed on multiple pages can mean the same issue is literally being served up over and over. Wow! Thanks! I always keep asking my dev team to implement the image thing. I’ll share this url. Thanks Nathan for this intresting article. Great article. I currently hire an agency called soulpepper to do my SEO and they are always reminding me of these easily fixable errors. Fixing them has helped my site out a lot.